Hazardous spills or explosions can happen at any moment. It’s important to know exactly who to call in the event of an emergency. However, to prevent emergencies, it’s vital to have regular cleanings from a professional industrial cleaning company. First Environmental is here to serve you and create a safer (and cleaner) workplace! Do you have questions? Call us at 1-888-720-1330 today. 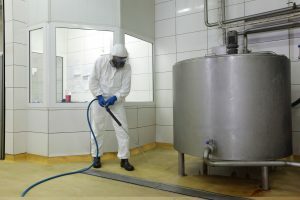 Why is it important to hire an industrial cleaner? Your workplace endures a lot over the years. It sees the coming and going of chemicals, dust, dirt, and more. When you hire an industrial cleaner, you are ensuring the decontamination of the facility. This not only contributes to the overall safety of your plant, but also the safety of your employees’ health. What kind of work areas do you clean? You name it, we clean it. We have extensive experience in many different areas of the workplace. From reactors to railcars, we know that spills or other unsafe occurrences can happen just about anywhere. We are well-trained and have the necessary knowledge to deep clean all areas of your facility to ensure safety for everyone. Allow us to service your company today. Contact us!